Issue: The Gene Giants know their market dominance looks conspicuously like an anticompetitive oligopoly, so they’re launching a series of initiatives – including the false promise of cheap, post-patent GE seeds – to mollify antitrust regulators and soften opposition to transgenics while advancing their collective market control. Meanwhile, the world’s two richest men – Bill Gates and Mexico’s Carlos Slim – are working with CIMMYT (the International Maize and Wheat Improvement Center) to make bargain GE seeds and traits available to farmers in the global South. The notion that farmers will benefit from a post-patent regulatory regime and Gene Giant charity is patently absurd. 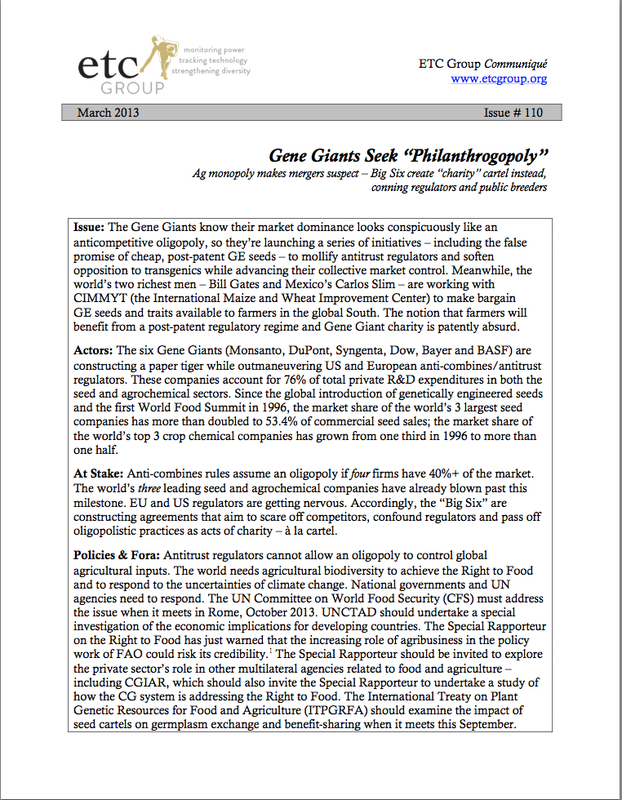 Actors: The six Gene Giants (Monsanto, DuPont, Syngenta, Dow, Bayer and BASF) are constructing a paper tiger while outmaneuvering US and European anti-combines/antitrust regulators. These companies account for 76% of total private R&D expenditures in both the seed and agrochemical sectors. Since the global introduction of genetically engineered seeds and the first World Food Summit in 1996, the market share of the world’s 3 largest seed companies has more than doubled to 53.4% of commercial seed sales; the market share of the world’s top 3 crop chemical companies has grown from one third in 1996 to more than one half. At Stake: Anti-combines rules assume an oligopoly if four firms have 40%+ of the market. The world’s three leading seed and agrochemical companies have already blown past this milestone. EU and US regulators are getting nervous. Accordingly, the “Big Six” are constructing agreements that aim to scare off competitors, confound regulators and pass off oligopolistic practices as acts of charity – à la cartel. Policies & Fora: Antitrust regulators cannot allow an oligopoly to control global agricultural inputs. The world needs agricultural biodiversity to achieve the Right to Food and to respond to the uncertainties of climate change. National governments and UN agencies need to respond. The UN Committee on World Food Security (CFS) must address the issue when it meets in Rome, October 2013. UNCTAD should undertake a special investigation of the economic implications for developing countries. The Special Rapporteur on the Right to Food has just warned that the increasing role of agribusiness in the policy work of FAO could risk its credibility. [i] The Special Rapporteur should be invited to explore the private sector’s role in other multilateral agencies related to food and agriculture – including CGIAR, which should also invite the Special Rapporteur to undertake a study of how the CG system is addressing the Right to Food. The International Treaty on Plant Genetic Resources for Food and Agriculture (ITPGRFA) should examine the impact of seed cartels on germplasm exchange and benefit-sharing when it meets this September.